I don’t remember where I was on September 12, 2012. I was in Chicago, but I wasn’t in the streets when the approximately 26,000 members of the Chicago Teachers Union (CTU) walked out of school and onto the picket lines. The 2012 Chicago school strike was the first time that Chicago teachers hit the line in twenty-five years, and their seven-day strike made history. I was a lunch break and a train ride away from being on the right side of history, and I failed to pick up the call to action. For the United Teachers Los Angeles (UTLA) union, it has been thirty years since they last walked off the job in 1989. On my way to Monday’s march around Grand Park, I crossed the street with a person who was on the phone with a student. This person was asking if everyone, all the other students in school, were in the school gym. “Oh Lordy,” was the next thing she said. I don’t know if she was a school worker or a relative, or maybe just a friend, but she was concerned. The Los Angeles Unified School District (LAUSD) has a total enrollment of about 485,000 students, a high number of which are low-income students who rely on school services like free lunch. Preliminary data reported that roughly a third of LAUSD students showed up to school on Monday, the first day of the strike. UTLA teachers are demanding smaller class sizes; salary increases; more funding for nurses, counselors and librarians; and a reduction in standardized testing . After twenty months at the table, UTLA voted to strike after breakdowns in bargaining, and because, as UTLA President Alex Caputo-Pearl says, “We are building a movement—in schools, and in elected offices.” LAUSD is the second largest school district in the country behind New York City, and the second-largest employer in Los Angeles. For those reasons alone, it is evident that this strike is an important one. The fact that California, the richest state in the nation, places forty-third out of the fifty states in per-pupil funding is another reason to pay attention to this strike. When you also factor in the demographic makeup of LAUSD’s students—75% Latino and another 15% racial minorities—and their teachers—43% Latino compared to the national total of 80% white teachers —it is clear that this struggle is about more than just what happens inside our schools. The stakes in the fight against the privatization of public education in Los Angeles are national in nature, and the fight itself a good bellwether of Democratic Party liberalism. If public education is condemned in the largest, richest state in the country, the state with a Democrat in the governor’s mansion and supermajorities in the legislature, then the fate of public education is in trouble. I’m new to LA. I’ve been following the fight, but I didn’t get all the jokes in the chants or the protest signs about Austin Beutner. I don’t know teachers who work here yet or many people with kids who are old enough to go to school. But I learned a thing or two in Chicago, and one of those things is that if we don’t support our public school teachers—on the line and by holding public officials accountable for public education—we lose good teachers and we lose good schools. Now is the time to show up for teachers and schools. I went out on Monday as a legal observer, but I didn’t see a lot of police or any counter-protestors. 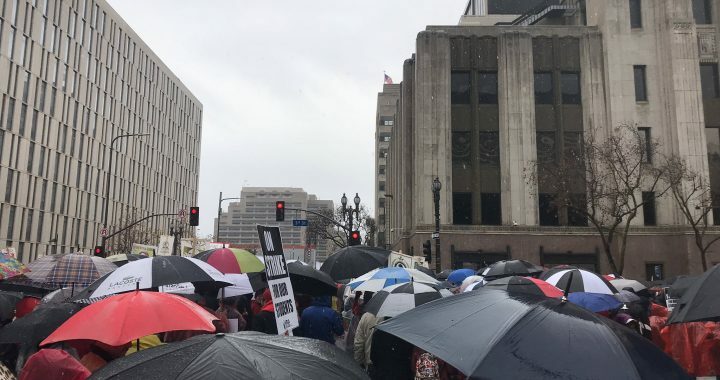 What I saw were thousands and thousands of teachers and students, soaked to their core on a cold and rainy day, pressed against each other like sardines on the street for hours, and they were incandescent. Walking in a slow circle, shaking water bottles full of pennies, the teachers outside the campus I was stationed greeted students coming in and out of school, offering snacks—doughnuts, homemade cornbread, hamburgers—water, and encouragement. Students asked their teachers about who they could go to for guidance on school and private matters, and teachers stepped out of the line to give them contact information for referrals. Students jokingly stepped into line for “extra credit,” and gave teachers advice on how to waterproof their shoes. I was buoyed by the love and care I saw during the march and on the line—the teachers love for each other, for their profession, their students, and their city. They were teachers, so they were extremely well prepared, but I was overwhelmed by the fact that they were out on the street fighting for the future of public schools, and they were still trying to make sure I was well fed. Teachers, it turns out, are people that we can learn from. Posted in NLG Blog and tagged Education, labor, NLG LA, Strike.